For those of you old enough, you may remember the hunky housekeeper Charlie in ITV drama The Upper Hand many moons ago. 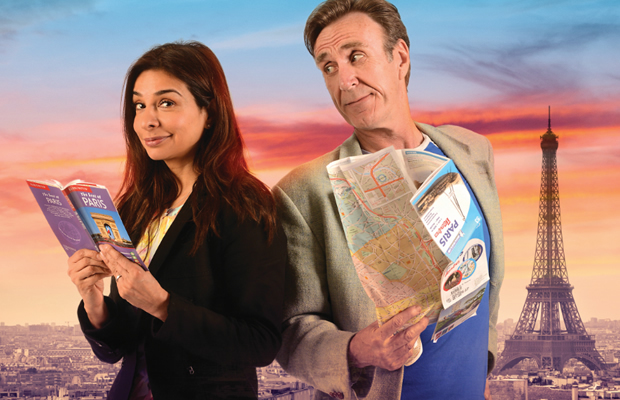 Joe McGann, the actor who played the single dad in the British spin off of Who's The Boss, is now touring the UK with play April In Paris. It's a bittersweet comedy that sees him being just as charming as all those years ago as Charlie. He is joined by former Coronation Street and Dinnerladies actress Shobna Gulati, who also appears from time to time on Loose Women. They are a dominant, likeable pair who have the personalities to carry off this two-hander even though it is only the two of them on stage for most of the show. April in Paris is a charming play about a warring couple who win a trip to Paris and find that the break reignites some passion in their dwindling relationship. I caught the play early on in the tour at Malvern Theatres, but it returns to the Midlands to Coventry's Belgrade Theatre in October after stopping off in Glasgow, Manchester and Richmond, to name a few. Written by John Godber, who writes realistic everyday life dramas and has previous work including Bouncers, it's a gentle but watchable drama. You may have already seen some of Godber's work without realising it as he is the third most performed playwright in the UK, after William Shakespeare and Alan Ayckbourn. 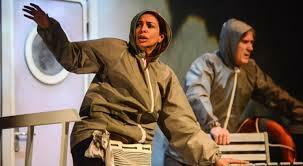 The play was nominated for Comedy of the Year in the Olivier Awards and there is plenty of humour, including a quirky pair of Parisien-style mime artists who occasionally appear to oversee a change of set. The story starts off in a gloomy fashion with the fractious couple making witty but constant snipes at each other at home. Al is an out of work small-minded builder with no desire to go abroad while his wife of 27 years is more optimistic, entering competitions to see the world between shifts at a shoe shop. The fun begins when she finally hits the jackpot, winning a trip by ferry to the French capital. Opening their minds to new places and food, the pair get into plenty of scrapes that will hit a familiar note with most couples. Gulati is refreshingly silly and much funnier than I gave her credit for while McGann is a reassuring romantic lead, who opens himself up to new ideas and cultures. There's still a touch of the charming Charlie from The Upper Hand about him - a role that made his a household name. Don't expect flowers and hearts as this isn't a sweep you off your feet romance. It's a slow burning observational comedy with heart. Tickets cost from £11.90 from the ATG theatre ticket website unless stated.